an economical & durable alternative to wood. 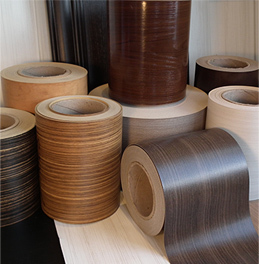 Cutting Edge is now offering our new primo series using Olon’s NEXGENTM laminate product! We are now stocking all 10 colors of the Tafisa VIVA collection. This is a perfect product for use in homes, healthcare facilities, schools and commercial buildings. Watch the video below to learn more. The Olon product line offers a truly perfect synergy. 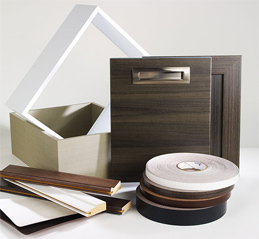 Our components are profile wrapped in the same base materials and prints to perfectly match LPL and HPL materials that are used on exposed cabinet exteriors. A complete accessory moulding program with crown, valence and corner moulding is available to perfectly complement your cabinetry. Our new LINK25 formable laminate in 4′ x 9′ sheets or continuous rolls is postformable for edges, tops or corners. Perfect for refacing or new construction. Several finishes offer a modern wood grain appearance. The colours and finishes of NEXGEN™ laminates make it nearly impossible to differentiate from real wood. Olon surface laminates allow for perfect colour matching and fade-resistance years after the original cabinetry is installed. Whether you want to add more cabinetry or simply replace a door, any new addition will be a perfect match to the original. Stile & rail construction with perpendicular grain direction perfectly resembles a wood door. 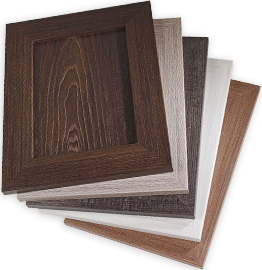 Olon 5 piece door components in NEXGEN™ laminates offer a permanent antibacterial surface with higher heat, scratch and stain resistance versus RTF (vinyl) and solid wood doors. Zero formaldehyde emission may be achieved with assembled doors.